The “Whiz Kids” of 1957 and 1958, Bill Wreden, Jack Bissell, Charley Swift and Barry Lydgate, with coxswains Steve Call in 1957 and John Wilcox in 1958, formed a unique four-oared crew that defied all the conventional wisdoms of the time. 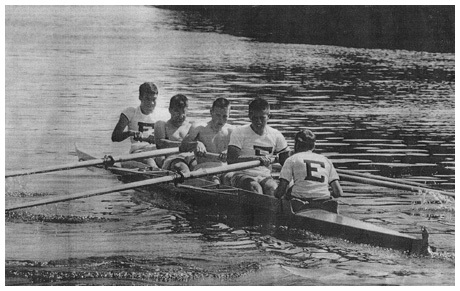 Assembled in the spring of 1957 to push an expected fourth boat of upperclassmen before we were disbursed to “the Clubs”, we just kept winning our time trials. By the start of the season we had qualified to race as the third boat in the opening race, at three-quarters of a mile with a strong following current, on Groton’s course. This crew: too short, too light, too inexperienced and with its largest oarsman rowing in the bow, began that season with a convincing victory that was truly the start of something special. While I am flooded with memories from the ensuing two seasons, including the disappointments that accompany any athletic undertaking, a few of those recollections stand out as worthy of particular mention. 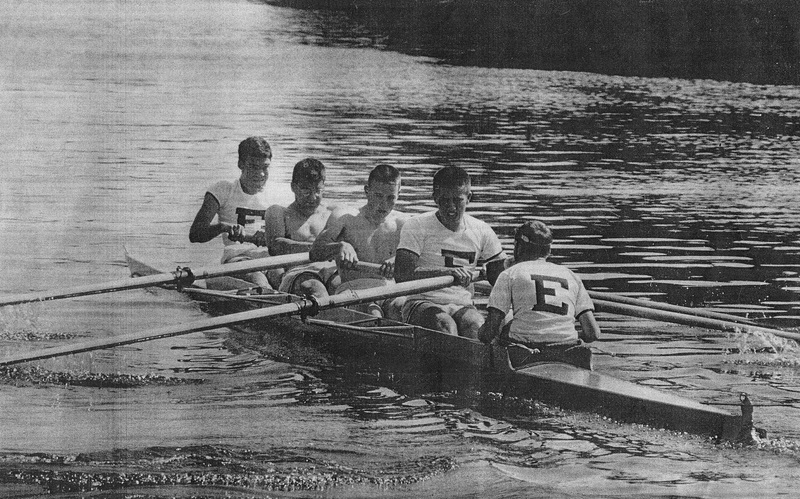 The first is just the chance itself to row in the same boat with a boyhood friend, Little League teammate and fellow faculty brat, Charley Swift, Jr. Also, what were the odds that the sons of Exeter’s latest successive crew coaches Hammy Bissell and Charles Swift would also be rowing one behind the other in the same four? A second reflection, also from that magical season of 1957, was our dogged advancement to second boat status, a position we never relinquished through any time trial. By the end of the season we were pushing a first crew (anointed since the start of the season) to better performances than they would have achieved without us. And by far the high point of that year was our victory as New England Second Boat Champions at Worcester. Until recently reading The PEAN Supplement’s account of our ’57 season, I had forgotten that we won the final by one and a half lengths. My most vivid recollection of that day was our completely controlled victory in our heat, knowing that we had followed “Swifty’s” instructions to save some strength and energy for the finals. Our victory at Middlesex the following week was just frosting on the cake that gave us a great feeling of optimism for the 1958 season. We did not achieve all our hopes and goals in 1958, but we quickly earned our position as first boat and had some great moments. With our classic sprint along the Swayze Parkway, we overtook Groton for a close victory to open the season. I even wound up with the shirt of John Lawrence, Groton ’58, their number three man and later Captain of one of Harry Parker’s first great Harvard crews. In our most gutsy race, we beat Belmont Hill on the Charles River in a driving rain that must have added thirty pounds of weight to our sodden sweatshirts in the bottom of the boat. In our third week, with a tailwind that probably would have let us use our oars as sails, we won over Brooks just three seconds short of their course record. Moreover, who of us can forget the joy of leading all the way at Worcester, with Pomfret and Belmont Hill just where we wanted them, sprinting towards the finish line at nearly forty beats per minute, at our time in our race, only to be struck by the wake of a wandering outboard, causing crabs that brought the boat to a standstill. The transformation of elation and expectation into bewilderment and then tears in the space of seconds was, in retrospect, a microcosm of life’s emotions usually caused by events over which we have so little control. I have always felt that we never rowed better against bigger, tougher competition than we did in that Worcester final in 1958, but fate intervened that day. As for our final week, the close loss in Thursday’s time trial, raced backward with the tide on the Squamscott course, to Larry Timpson’s crew buoyed by its own victory at Lake Quinsigamond, exceeded even our disappointment at Worcester. But from that event emerged a moment of leadership from Bill Wreden that I will never forget. In our Friday paddle to get ready for Saturday’s home race against a Middlesex second boat that was undefeated, Bill said we are not only going to win, we are going to bury them and when we finish it will be with “oars off”, setting up the boat with our knees, as if it just a workout. This was the challenge we needed to get our edge back, and we went out and did it, posting the fastest time of the day, coasting for yards after the finish until we neared the wall. So, if the “Whiz Kids” didn’t finish what they started by winning the Columbia Cup against Middlesex, they at least finished as they started fourteen months before, with an open water victory over solid competition. With a stroke like Bill, never a slave to the stop watch but one who always found the pace he wanted to set; with a bow man like Barry who pulled us through the water with a high finish that kept our bow planing; with two fac-brats in the “engine room” who had spent so much time together since childhood that they were able to row almost as one; and with two successive coxswains who steered beautifully and knew how to get the best out of us; we can now appreciate, some fifty years later, that we were privileged to be part of an athletic and indeed a life experience that was truly remarkable. Reflecting once again on the start and finish of our career as the “Whiz Kids” it might also be said that, as Exeter itself challenged us, we began as boys and finished as men.